As a Regional Color Coordinator for John Paul Mitchell Systems®, I have had multiple layers of direct dye on their hair for years. Needless to say, I was super excited to test out the new POP XG™ Reducer. But first, a little background on my hair: I’ve been using POP XG™ in Bordeaux every 6 or 7 weeks for the last few months. Underneath that, my ends were a very stubborn blue tone left over from a year or so of green direct dyes (INKWORKS® and POP XG). I used Pop XG Reducer with 10 volume, but you can mix with water, 10 volume or 20 volume depending on how much strength you need. While the maximum processing time is 45 minutes, I rinsed after 30. Before I rinsed, it looked like it was going to turn out a lovely light salmon tone. To my surprise, all that pigment washed away to reveal an even, clean canvas. 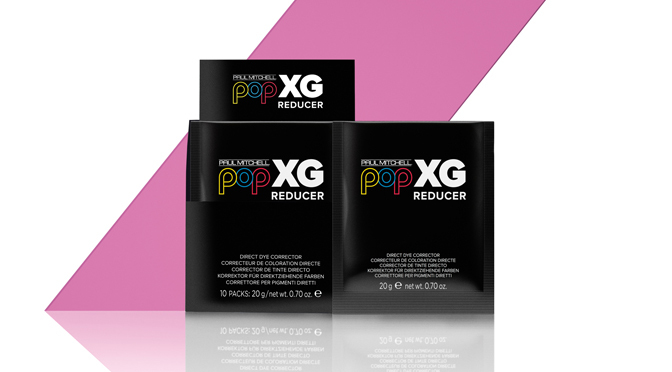 POP XG™ Reducer took out the blue that had been stuck in my hair since 2015! Since my hair felt a little dry, I did a topcoat of The Demi and my hair was left softer and healthier than when I started. I absolutely cannot wait for stylists to get their hands on this tool! Book a class with one of our highly trained color educators to learn more!